November - The weather this year can only be described as extreme and this month has lived up to the description. In the early part of the month Steve was in the garden cutting the lawn and within a week we had snow, frosts and icy roads. It's been a cultural month with a couple of visits to London, several visits to the theatre and two cinema trips. We spent a weekend with Jane's brother, Richard, in North London. 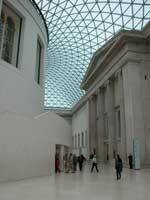 It gave us an opportunity to visit the British Museum to see the Inside Mummy display. This is a 3D film - you have to wear Polaroid spectacles to see the effects - and is really superb. A sarcophagus has been put into an MRI machine and the internal view of the coffin and the body have been developed into a three-dimensional view. It only lasts twenty minutes but it is fascinating. The British Museum as a piece of architecture is wonderful and we visited it a second time when we were in London to see Spooky Tooth and Humble Pie later in the month. We also went to see Privates on Parade in an off-West End production because our neighbour's son was the lead character. We found it very entertaining, professionally produced on a minimal budget. The cost of putting something like this on in the West End, even in a small theatre, must be prohibitive. We completed the day with a delicious meal at a Turkish restaurant, in Islington, not far from where Richard lives followed by watching The Matrix II DVD. On the Sunday morning we had a lazy start and headed back to Northampton after breakfast. This month has been a bit of a retro period for music. Steve went with Kate, Martin, Sue and Graham to see John Mayall and the Bluesbreakers featuring Mick Taylor with Chicken Shack as the supporting band. Jane decided she'd prefer to go tenpin bowling with the staff from the surgery where she works. It was a good night for guitar solos but there was nothing that Steve remembered apart from "I'd rather go blind". John Mayall is so uncool with a very false stage presence that makes you want to cringe. We also went to see the remnants of Spooky Tooth and Humble Pie at the Islington Academy. The venue was filled with mainly men of a certain age (mid fifties) and follicly challenged, it was smoke filled, hot and it has been a long time since we've had our organs vibrated by the loudness of music. We went with Nick, Val, Graham and Sue and Nick drove. It was entertaining to watch Nick drive in London traffic and the phrase "death wish" comes to mind - not for anyone with a heart condition. The Journey back was equally exciting with the speed limit on the M1 proving to be somewhat academic, it's a long time since either of us have travelled so quickly without being in an airplane or on rails. The Manchurian Candidate was a free film. As a result of Jane's mum staying with us one weekend we always buy her the Telegraph and there were tokens for free tickets so we just had to go. No seats were allocated, a bit like Easyjet, so you had to arrive early to get decent seats and we're glad we did because the auditorium was half full when we got there thirty minutes early and shortly afterwards there were only the front, neck-breaking, rows left. The film is great for supporting all the conspiracy theories that ever existed and for those suffering paranoia it just confirms that there's no need to worry because they are out to get you... Jane was of the opinion that it didn't need the big screen and would have been OK on the TV. Not a big hit then. Orange Wednesday has a lot to answer for - if you've got an Orange Mobile phone when you buy two tickets on a Wednesday then you get one free, hence Orange Wednesday. We went to see After The Sunset because it had Pierce Brosnan in it and seemed OK in the previews but it was really just a remake of many other diamond heist movies. It had elements of humour and romance with Brosnan showing his talent (body) for the suave, roguish behaviour he displayed in the Bond movies. It's sad that he will not be appearing in any more Bond movies. We have been so impressed with Orange Wednesday that we've decided that we will change Steve's BT mobile for an Orange account, it will also mean that calls between our phones will be cheaper if we use the same service provider. The garden had some flowers in bloom and it was warm enough for the grass to be growing, so much so that Steve had to cut the lawn. He has never, ever cut a lawn this late in the year. 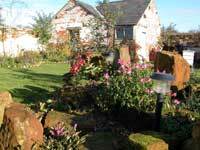 We covered up plants in readiness for frosts particularly the Canna, Bottlebrush and the Orange tree. Why do garden centres tempt us with plants from the Mediterranean and South America that need lifting every year, placing in warm, dry compost and then replanted in the warm spring ground - Cannas are very pretty but we're not sure they're worth all that effort so we've decided to leave it in the ground, cover it up with bubble wrap and hope for the best. We had hoped to get our path next to the barns completed this month but we've been so busy and the weather has been against us so we've done very little outside. We did have a wonderful autumn bonfire which burned all the garden rubbish Jane had collected over the past few months. We've been discussing changing the kitchen for a long time. We never liked it from the moment we moved in, so much so that we never took any photographs of it in its original state. After a few years of living with dark cupboards Jane took matters into her own hands and painted all the units and doors white. This brightened the whole room overnight (it took at least 4 weekends of hard brushwork) but it still seemed awkward and smaller than it should've been. Rather than replace the whole kitchen we decided to have the plinth that stuck out into the room removed but we agreed this was beyond our capabilities so we paid Lee to do the work over a weekend. He has done an excellent job and it would be difficult to see the join between. We now have a problem replacing the missing tiles. The existing tiles are 11 inch square which is most unusual and we can no longer get hold of them so we can either replace the whole floor or cut 12 inch tiles down - we'll probably go for the latter and have got a few enquiries out as to how we can have the cut to size professionally. When the floor has been sorted we intend buying a small table, possibly from Ikea, so that we can eat dinners in the kitchen when there's just the two of us. We've also had additional units added to the Utility room and it now looks far superior to the kitchen, it doesn't look like our house at all. 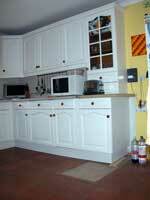 Jane will now have "fun" filling the new cupboards in the utility room and reorganising the kitchen cupboards. We went to see Gervase Phinn at the Derngate Theatre in Northampton. We've read several of his books about his experiences as a school inspector in the Yorkshire Dales. The books are amusing as well as touching and so we thought a one man show would be interesting. He held the stage for several hours with his anecdotes and application of common sense to the rituals that take place in schools. It was an excellent evening. 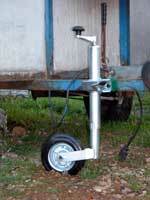 Steve replaced the jockey wheel on the old but very useful blue trailer. We got this when we bought the balloon basket and it is now used for carrying rubbish to the tip, collecting logs and generally ferrying very large objects around. Steve had the unpleasant task of going to visit an "angry" farmer he landed on during September. Over a friendly cup of coffee one Saturday morning they shared their experiences of farming and ballooning in a very amicable way. Unfortunately Steve could not persuade him to allow balloons to land and so the OS maps were marked up as a sensitive area - this is a large estate and could make flying difficult in this area in the future.